Located 70 miles east of San Antonio, Gonzales has played an integral part in the history of Texas. In 1825, while Texas was still a part of Mexico, the first primarily Anglo-American settlement in Central Texas was built around seven squares in the Spanish manner. During the Texas War of Independence, 32 townspeople volunteered to help defend The Alamo where, with the exception of one person, everybody perished. The city’s greatest claim to fame arose when the community waved the famous “Come and Take It” battle flag before Mexican troops that were sent to retrieve the town's cannon. Despite being greatly outnumbered, the citizens of Gonzales ultimately prevailed. 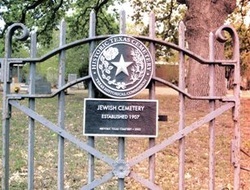 Gonzales’ place on the Jewish map of Texas is cemented by the presence of two cemeteries, which testify to a long-lived, though now extinct, Jewish community. The Jewish presence in Gonzales began with one of the most interesting figures in Texas Jewish history, David Levi Kokernot. Born in Holland, and an immigrant from the West Indies and New Orleans, Kokernot may have been the first Jew to live in the region when he settled there around 1830. From all accounts, he was a rabble rouser of the first degree, and manifested his independence in the mid-1800s by converting to Protestantism and adopting the rancher lifestyle traditional in Gonzales. The Jewish community of Gonzales began to grow substantially in the 1870s, with the arrival of Jewish merchants and peddlers. Over the next 40 years or so, families such as the Stahls, Michelsons, Forgotsons, Ephrons, Orinovskys, Gurinskys, Friedmans, Tudzins, and others arrived to take their place in this small town of approximately 4,000 people. Even at the height of its Jewish presence, it appears that no more than 40 to 60 Jews lived in the city. However, their existence was very much part of the commercial activity of Gonzales. Solomon Stahl arrived in Gonzales from Poland in approximately 1880 via New York. He brought a Torah with him, which helped the small Jewish community to begin worshiping together. In a manner befitting the Texas spirit, Solomon kept the Torah at home in a lovely ark alongside a loaded .38 millimeter gun. He had great commercial skills and owned a fancy hotel and restaurant named the Plaza, which drew diners from all over the area. He also owned several saloons and invested in many other ventures. Stahl’s son became one of the few doctors in town and his grandson Marion, himself a doctor, recalls his father often being paid with chickens, eggs, and other foodstuffs. This collection of Jewish families began to organize Jewish institutions by the mid-19th century. They established a Jewish burial society named “Buh Israel” and acquired land for a cemetery. The first burials took place in 1861. As the cemetery was the only of its kind for miles, when Jeanette Hirsch of Corpus Christi died, her body was transported 140 miles to Gonzales for burial. When Captain Richard King, the famed founder of the King Ranch and a friend of the Hirsch family, learned about this, he donated land in Corpus Christi for local Jews to be buried there even though he was a Gentile. The Gonzales cemetery is located four miles outside of town on a plat in the middle of privately owned ranch land. Over the years, the cemetery has fallen into a state of disrepair, though Congregation Beth Am from Houston has done work to repair the site. In the traditional style, the Hebrew language side of the gravestones point east. Gonzales’ Jewish community was never large enough to build a synagogue. Informal services were usually held in members’ houses, and the community celebrated the High Holidays in the American Legion Hall, oftentimes under the tutelage of a rabbi from Hillel in Austin or Jesse Lee from San Antonio. The only men who knew how to read the Torah were the immigrants Solomon Stahl and the Tudzin brothers. Sunday school instruction was the responsibility of the older children and single men. Ida Orinovsky recalls the existence of a small choir, although she noted that Sunday school was not always held, and in fact it appears that few, if any, of the boys ever had a bar mitzvah. In addition to the Jewish society of Buh Israel and in connection with some surrounding towns such as Luling and Lockhart, there was a Morris Tannenbaum B’nai B’rith Lodge that acted as a focal point for the community. ​Gonzales Jews were involved in a wide array of businesses. The Michelsons had a candy shop and café, which also served as the Greyhound bus station, as well as the local Coca-Cola franchise. The Tudzins, who arrived with a pushcart, opened a store, as did other Jews. Marvin Stahl and his family ran a very successful turkey and poultry farm and processing business while other members of the family sold and processed hides and furs. Tragically, Marvin drowned in the river in 1952. Irving Forgotson sold insurance. As in so many other Texas towns, the Jewish inhabitants were able to thrive alongside those of other faiths. In fact, a review of newspapers from the turn of the century and shortly thereafter clearly indicates that there was a considerable number of non-Jewish dry goods and general merchants who shared the marketplace. As the middle of the 20th century approached, Gonzales like many small towns, began to decline in population. Most of the young Jews left town for college at the University of Texas, Texas A&M, or places far away, only to stay in Dallas, Houston or Austin where they began their adult lives. As a consequence, it appears that the last Jews left before 1960 and none live in Gonzales today. Although they were generally not prominent politically, the Jewish community of Gonzales left their imprint on the town through their commercial and cultural activities. Today, the most visible remnant of the Gonzales Jewish community is a piece of land on Water Street that The Society of Buh Israel bought from Solomon Stahl for $1 in 1907. This site became the home of the new Jewish cemetery, a well-kept place with headstones dating from the early part of the 20th century through the last few years. The dates of the headstones are telling in that although Jews have been gone from this area for close to 60 years, families still find comfort in having their loved ones placed in one of the many family plots that exist. The cemetery demonstrates the connection that still remains between Jews and Gonzales.